Memories of his past incarnations haunt Demascus, even as he searches for stolen portraits that contain the trapped souls of demigods. Meanwhile, drow creep beneath the city of Airspur, intent on precipitating war between Akanûl and a rival nation. As Demascus attempts to win freedom from the ghost of his murdered lover, he agrees to thwart the drow’s secret scheme, sending him on a trail that stretches between the Demonweb, Airspur, and an island that appears on no map.Spinner of Lies is the sequel to Sword of the Gods and takes place a few months after Sword of the Gods. We meet back up with the cast of the previous book, Demascus, a divine assassin known as the Sword of the Gods, Riltana, a wise cracking windsoul genasi who steals from the wealth of Airspur, and Chant Morven, a pawn shop owner with a network of informants that keep him abreast of events in the city. There is a new addition to the group, Jaul Morven, Chant's son. Their relationship is not on the best of terms and this provides a great side plot to the story. I really enjoyed group's interactions, especially Riltana's scathing comments to Demascus in the heat of battle. Bruce's crowning achievement is his characters. He is able to weave a tight story but at the same time you get to hear the character's inner monologues describing their hopes and fears. Things like Demascus's fear of losing his identity, Riltana's hopes for her estranged lover, and Chant's worry for his son, helped draw me in and really feel a kinship with the characters. Readers of Bruce's Abolethic Sovereignty will be happy to see Captain Thoster, the captain of the Green Siren, again. There is also a reference to the Advanced Dungeons and Dragons module, Tomb of Horrors, that longtime players will notice. (I really enjoyed the reference).There are lots of things going on in Spinner of Lies. The first is Queen Arathane's request for Demascus and company to discover the reason communication has stopped to a mine on a secret island that left unchecked could lead to war with Tymanther, next is Demacus's murdered lover that has come back to haunt him, then stolen paintings that hold the souls of demigods, and finally a potential drow invasion. That is a lot of ground to cover in just one book but Bruce takes these plots and spins them (no pun intended) into thread that reaches a very satisfying conclusion.Central to the plot are the drow. The drow have been a favorite race of mine since I first read R.A. Salvatore's Drizzt series years back. Why are they lurking in Airspur and who are they in league with? Spinner of Lies is part of Wizards of the Coast's Rise of the Underdark, an event that will have bold, sweeping ramifications across (and under) the Forgotten Realms.Even with multiple plots going on there is still time to focus on the main character, Demascus. He is a divine assassin, the "Sword of the Gods", an instrument of divine retribution. These words are inscribed on Demascus's sarcophagus:"Agent of Fate, Emissary of Divine Judgement, Cuttter of Destiny's Thread. You died as you lived, and you will live again, Demascus, Sword of the Gods. "Yet he is still only a shadow of his former self and without his artifact, the Whorl of Ioun, he is more human than divine agent of vengeance. But is this necessarily a bad thing? Demascus wants to be more human, and not a tool of the gods, to control is own destiny. He can feel the other part of himself, the part that revels in destruction, waiting to take over, and has to fight to keep it in check. It would be so easy to let that part take over but it would truly cost him his humanity. There is a scene where Demascus seeks divine counsel and things do not go well. The dialog that occurs during that scene is fantastic.I am ashamed to admit it, but I normally do not think on how well the title of a book fits a story, I concentrate on the characters and the story itself, but this time the title really stood out to me. Spinner of Lies is a very apt title as it perfectly describes the parallel plot lines in the book. I will not go into detail as to spoil it for other readers, but it was very well done.I have been a longtime reader of Bruce's work and he continues to write books worthy of any fantasy reader's bookshelf, and Spinner of Lies is no exception. I give this book 5 stars and highly recommend it.Spinner of Lies will be available in ebook on June 5, 2012 at Amazon and Barnes and Noble.This review was of an ARC from NetGalley. Having read the previous Sword of the Gods book and enjoyed it, I figured I would pick this up years later, remembering that book fondly. I was surprised by how much this tied into other events in the Realms, relating back to several other novels I have read by featuring characters and concepts from those books, which added to my enjoyment of this book quite a bit. I don't think there is so much of that that you can't enjoy this book on its own, but at the very least, it would make sense to have read the previous book. I liked the way Demascus's character was fleshed out further here, since he was something of a blank slate in the previous book, and his story is rather interesting. It's unfortunate that no further books have been published, as far as I know, and it seems unlikely that more are forthcoming. Still, this was an enjoyable read that establishes a new corner of the Realms. I was given this book(digital version) by the publisher for an honest review. I am not being paid for this review. Let's get some things out in the open, I am a huge fantasy fan. I devour fantasy novels and I know that I have barely scratched the surface of what the fantasy genre has to offer. 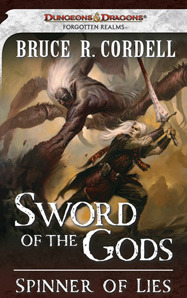 I have no read any novels by Bruce R. Cordell and I wasn't sure what to expect. I felt like there was a lot I was missing because it seems as if this book is a part of a series. In fact it is part of a series, it is a Book 2. Some fantasy novels that come in a series are great as standalone novels, this one isn't one BUT it is good enough. However, without reading the first novel, I didn't grasp the relationships between the characters as fully as I could have if I had read the first book. I was introduced to Demascus, an assassin that since he doesn't have full grasp of his memories can't really control his superb like skills of the Sword of the Gods. Then there is Riltana, a windsoul thief who steals fromt the wrong group of people and basically though she can fight, she runs to Demascus for help. There is Chant who I couldn't really grasp what he was besides someone who seemed to know everything. The books are written for Dungeon and Dragons fans and though I'm not a fan, I definitely found the book enjoyable. I would be interested in reading the first novel to get more of an understanding of the characters. It is obvious that there is more to come in this series. It was apparent from the very beginning with so many loose ends, questions that Demascus has about himself (he's getting played by the Gods but for some reason he doesn't seem to realize this), the vampire allies, Chant's son who is willing to sell his soul to be a part of the biggest gang there is. Not much world building in this book but I'm wondering if a Dungeon and Dragons fan would need that since they understand a lot of the terms in the book. I was not disappointed with the read, it was one of the better books that I have reviewed that was given to me by a publisher. I would recommend it to any fantasy reader but I would caution you to not read this one first. Read Book 1. This book gathers momentum nicely the further one gets into it and makes for an enjoyable read. I must admit that when I first started it I had two problems. I guess i am quite traditional in my view of "Fantasy" literature and I expect the characters to speak in pseudo-midevil dialects. The modern idioms used by the characters here at first made me think Mr. Cordell was just being lazy. However as one buys into his fantasy setting and starts to "willingly suspend disbelief," the modern language usage becomes less jarring.Even though I have played D&D for three decades, I had some problems with the races of the main characters being primarily a Deva and many Genasi. I had even played a Deva character in the game before but I still had a problem with visualization. But I imagine the first readers of Tolkein probably had problems visualizing the nonhuman races integral to his work. The pacing of this novel is pretty good. Mr. Cordell's strength is definitely his imagination and ability to bring novel ideas for his characters to deal with. One will not run into the timeworn heroic fantasy plotline here. He does a fine job of dealing with character motivations particularly in Demascus, Madri and Chant, I thought.To be completely fair to Mr. Cordell, this book is the second in a series and I had not read the first. If I had, perhaps the two slight problems I mentioned earlier might have been mitigated. I recommend this book to those looking for a good read, but perhaps you (and I) should read the first book before it. Was pleased to find I didn't need to read Sword of the Gods to follow the book. The pacing was excellent and the action scenes zip along at that magic point of not being so long I skip them or too short and I forget they happen (a common problem with fantasy books). Bruce manages to craft a tale which actually makes me care about a Forgotten Realms post Spell Plague (4th ed.) which is no small feat by itself. The name is aptly given as there is no single thread but many woven together. The characters aren't one note stand ins but fleshed out with desires and agendas of their own. I certainly look forward to the next.